NICC is proud to show new work by the amazing Belgian artist Guy Rombouts (1949, lives and works in Antwerp). Since the early 1980s, Rombouts has blurred the existing boundaries between words and objects. The idea of having objects speak for themselves, acts as a drive and utopic horizon behind his artistic practice. The result is a body of work that is idiosyncratic, poetic as well as conceptual. The artist’s very own bounded set of ideas has become a kind of art-producing machine: his ‘concepts’ make his works come about more or less automatically. The result is never egotistic, but invariably particular and tactile. Rombouts’ work — he is the son of a printer and trained to be a typographer — is rooted in a fascination with the shapes and the stuff language is made of. In the early ‘80s, when he made what could be viewed as his ‘primal’ work, he collected objects whose names consisted of three letters, and exhibited them in alphabetical order. Rombouts is probably best known for his Azart alphabet, which he developed in 1984 with his partner Monica Droste (1958-1998). The line-based alphabet allows words to take on an endless array of two/three-dimensional shapes. Ever since it was first designed, it has served as a deliberately coincidental procedure for creating objects, sculptures, paintings etc. Inspired by Azart, Rombouts has recently created new, graphic ways of translating words into images. Using the website www.azart.be, everyone can generate images in Azart. Rombouts will present an installation of new works at NICC. 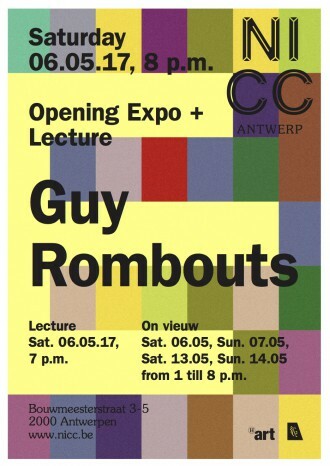 On the day of the opening he will give a lecture on his work, and how it evolved.